In my previous article i have given the basic idea about the business intelligence and different concepts of Business Intelligence. In this article i will try to give you the idea about the latest concept named ‘Big Data’.With this concept i will try to explain Big Data vs Business Intelligence with different real world examples used in industry.The difference between Big Data & Business Intelligence is synonymous to fishing in the sea versus fishing in the lake. Your target is the same but the tools are decided by the scale.Before going to the Big Data vs Business Intelligence I will try to explain the basic concept of Big data. Now a days world is becoming increasingly digital space.Today we manage,share and store our lives online.The data has been collected by different systems like computers , smartphones.But that is just a beginning.Soon most of the things like TVs,Watches will collect the information and will transmit data.I have showed the data created and collected previously and now in following diagram. The Big data is nothing but the collection of the data which is in form of structured information or unstructured information. The big data includes the Structured data as well as non structured data.But here the main problem begins,The Big data is very huge data with structured and unstructured information. The data is collected from so many data sources.But there is need to convert the collected data to knowledge so that the information is become useful to the end users as well as big industries.There could be endless possible Big data applications.’Big Data’ is a term used to describe collection of data that is huge in size and yet growing exponentially with time.In short, such a data is so large and complex that none of the traditional data management tools are able to store it or process it efficiently.It’s not the amount of data that’s important. It’s what organizations do with the data that matters. Big data can be analyzed for insights that lead to better decisions and strategic business moves.I am writing this article of Big Data vs Business Intelligence but before that you should know the concept of what exactly the Big data is and how it is useful for different businesses.Before understanding Big Data vs Business Intelligence we need to understand about Big data as well as business intelligence. The Big data is not only the user information but it is also the information collected from different organizations.The best example is the weather data.The weather data can be collected from different satellites which is huge amount of structured as well as unstructured data. Business Intelligence mostly associated with organizations data which includes the historical data as well as current data where as Big data is any kind of data associated with the organization of specific user of that organization which is in raw form or structured and unstructured form. Business Intelligence uses different stages to process the data and collect the data from multiple heterogeneous sources and stored it in to the data warehouses in structured form.It uses ETL which is Extract Transform and Load process for processing the data. Big data does not use the ETL process for processing the data. The Business Intelligence ETL process Dumps the Data in to data warehouse. In Big data there is no concept like data warehouse. The final stage of Big data is Business intelligence where user will find the refined data model which will give the different reporting to grow the business. Big data includes all structured and unstructured huge information which will or will not be useful but Business intelligence will give us the historical as well as current data refined information which is very useful for business perspective. These are different point of Big Data vs Business Intelligence. 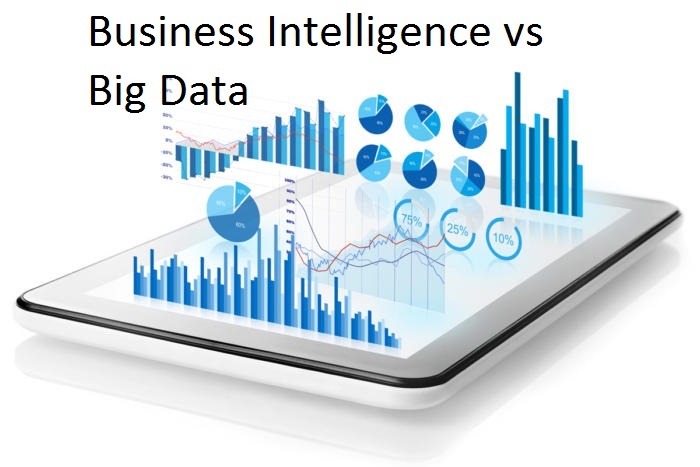 Hope you get the idea about the Big Data vs Business Intelligence .If you like this article on Big Data vs Business Intelligence do not forget to comment in comment section.